Giant Darth Vader Wall Appliqué. The Dark Lord stands an imposing 70-inches tall! This Star Wars-themed wall decal is sure to be the focus of any room. Easy to apply, remove, and reposition. The saga continues... on your wall! The saga continues... on your wall! 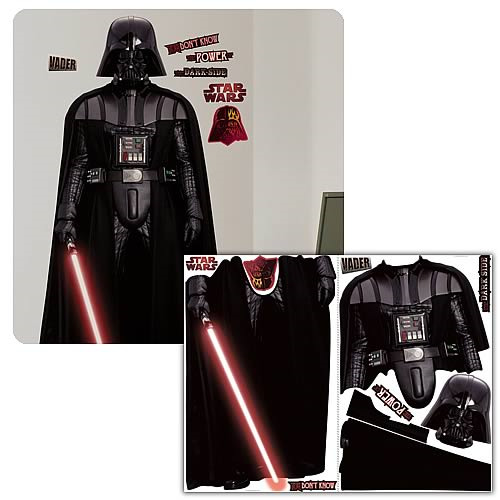 Bring a touch of the dark side to any room with this Giant Darth Vader Wall Appliqué. After all, the Dark Lord "requests" it. Standing an imposing 70-inches tall, this Star Wars-themed wall decal is sure to be the focus of any room it occupies! Application is easy: just peel and stick each precut sticker into place, and add the additional logos and sayings as accents anywhere you please. With a total of 11 decals spread across two sheets, this is a stunning selection for Star Wars fans of any age! When fully applied, Darth Vader measures 70-inches tall x 36 1/2-inches wide.